This recipe will combine three of your favorite cookies into one. 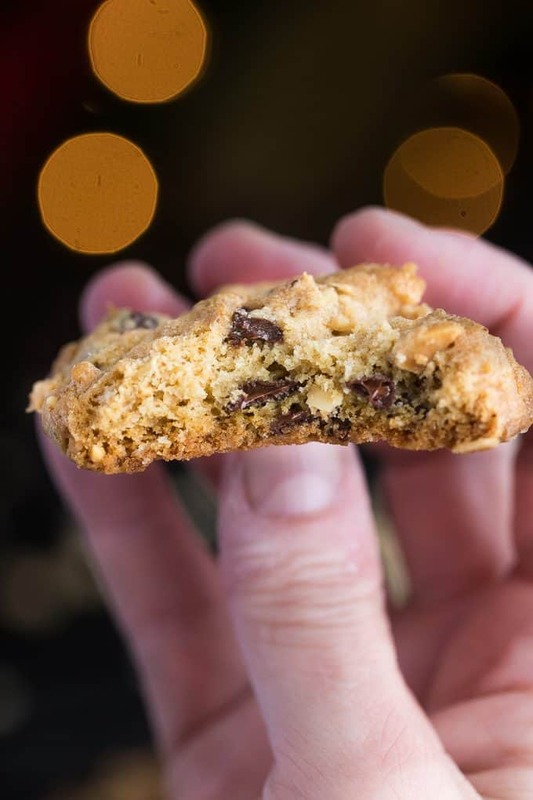 Peanut butter and Oatmeal Chocolate Chip Cookies are a mega-delicious cookie! Packed with mini chocolate chips, browned butter oats, and finish it off with creamy peanut butter and chopped peanuts for crunch. The idea behind this cookie came from when I couldn’t decide what type of cookie to make. I was in a toss up between peanut butter cookies, oatmeal, or the classic chocolate chip. Then it hit me, why not take my favorites and create the ultimate loaded cookie!? So I got to work, and create one wonderful cookie that gives you your favorite flavors. Why is this cookie the best? 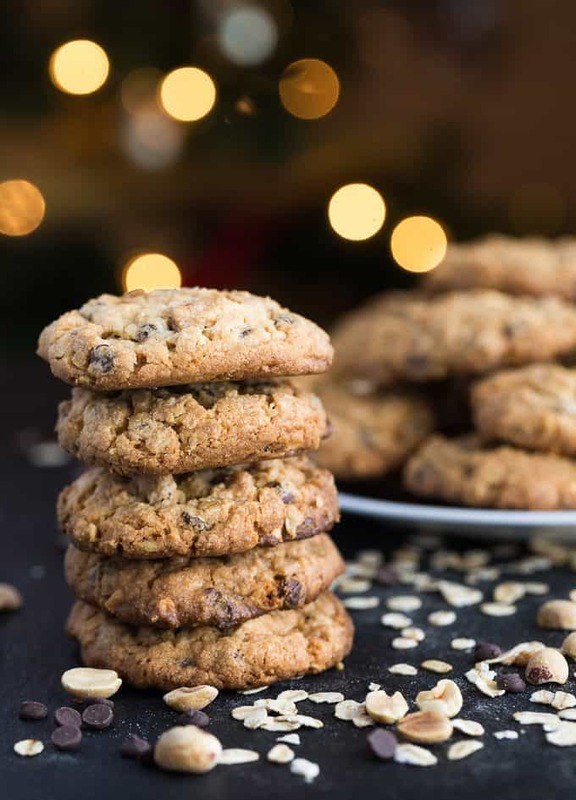 You have a tender and soft base from the peanut butter, mixed with browned butter oats for texture and sweetness, add in the chocolate chips and nuts, and call it the best cookie ever! You have the perfect texture paired with the right amount of sweetness. Pour a glass of milk and dive in. I haven’t come across a cookie that I haven’t like. 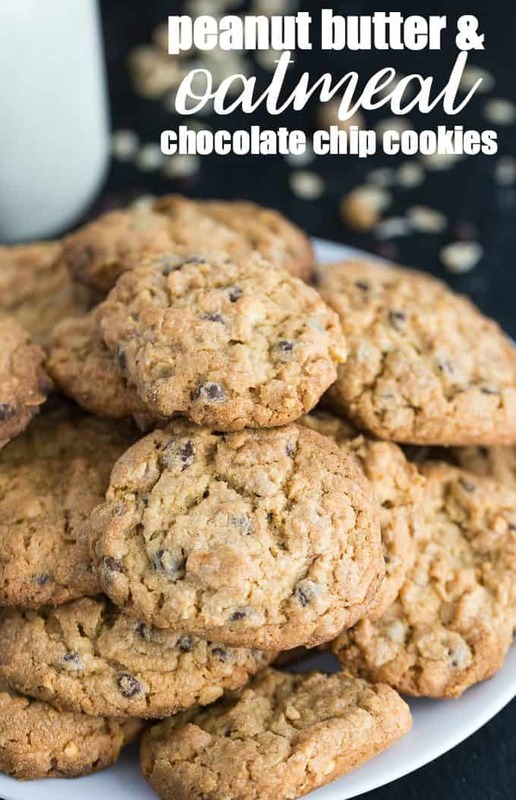 While some are higher up on my favorites list, these Peanut Butter and Oatmeal Chocolate Chip Cookies takes the gold trophy. Want to master this cookie recipe, so you end up with tender and soft cookies every single time? Follow these steps below and set yourself up for success! Dough | Sometimes depending on how you measure your ingredients, you could end up with extra soft or even dry dough. Make sure to measure correctly. Look for the mixture to be formed and not too sticky. If it seems sticky add a little bit more flour and blend. Beating Sugar and Butter | This step gets overlooked often. You need to beat the butter and sugar until it creams together. It will give you a light and tender cookie if you take the time. You want to cream the butter and sugar together for around 2-3 minutes. You will see mixture gets a lighter color and become fluffier in texture. Butter | Talking about butter you want to make sure you allow it to soften at room temperature, vs. melting it. Melting it can affect the texture of your cookies. Eggs | Room temperature eggs just like butter are essential. When you use cold eggs, it can change the texture of your cookies. For a light, fluffy cookie, allows the eggs to reach room temperature. Preheating Oven | Take the time to preheat the oven as you start mixing your cookies up. Allow it to reach temperature for at least five minutes. This will give your cookies an even heat that they need for baking properly. Cookie Scoop | Invest in a cookie scoop, so you get the same size cookies each time. The reason is if the cookies are the same size, they will bake evenly. Each cookie will have the same texture instead of some being underbaked, and others overbaked. Baking Mat | Consider buying a Silpat baking mat or even parchment paper. This will help you remove cookies easily from the pan without worrying they will stick. It also makes cleanup a breeze. If you love that soft, chewy texture, here is how to keep your cookies chewy. Allow them to cool on the baking sheet for a few minutes before you transfer to a cooling rack. Then once they cool place in a sealable bag or airtight container. I have found that placing a half a slice of bread in with the cookies will keep them nice and soft and chewy. Sounds weird but it works! Yes! You can freeze Peanut Butter and Oatmeal Chocolate Chip Cookies. Allow them to cool completely on a cooling rack, and then transfer into a freezer-friendly container or sealable bag. You can keep them in the freezer for 2-3 months. Just thaw and enjoy the cookies. I love to freeze what I know we won’t eat right away. Then when I get a craving pull a cookie or two out and allow it to thaw. I have even tossed them in the microwave to give it that fresh out of the oven taste. I hope you all enjoy this recipe as much as I do. You get the mix of three famous cookies all in one batter. 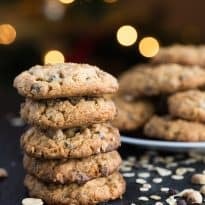 Mega delicious cookies packed with mini chocolate chips, browned butter oats, creamy peanut butter and chopped peanuts. BROWN ½ stick of butter in a sauce pan over medium heat. Add oats and cook for 5-7 minutes until oats are soft. Spread oats on a baking sheet to cool. Beat butter and sugars together on a medium-high speed until light and fluffy. Add egg and beat until well combined. Add oats, peanut butter, peanuts and chocolate chips and mix until well combined. Add flour mixture and beat on low speed until combined. Scoop out cookie batter with a small ice cream scoop onto baking sheets lined with parchment paper. Bake until golden brown – about 12 – 15 minutes – making sure to rotate your baking sheets half way through cooking. These look amazing! 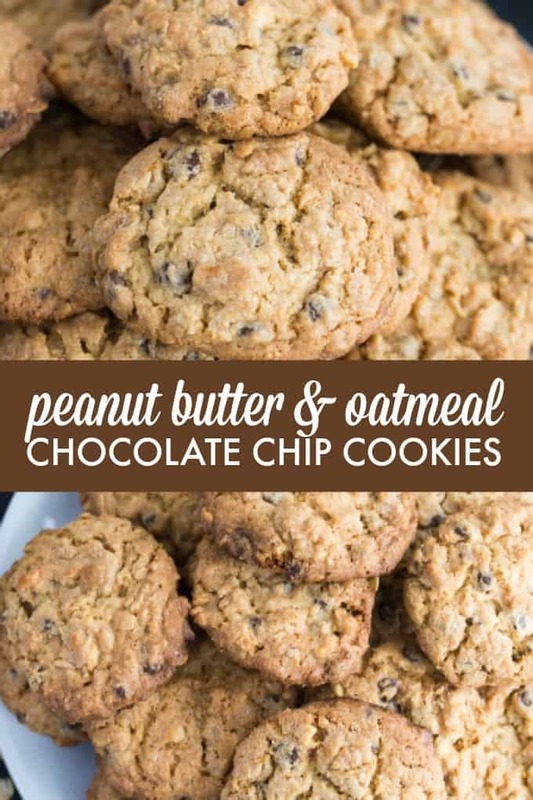 I love using oats in cookies, and I bet the peanuts just make these divine. Thanks so much for sharing the recipe! Oh my, these look so delicious! Everything I love in a cookie! Thank you for joining the fun over at The Creative K Kids’ Tasty Tuesday. I look forward to seeing what you share next week! Pinning this. The cookies look so delicious!